Continental Portugal has about 1230 Km (765 miles) of sea coast, as well as many rivers and lakes. Fishing has always been one of our main industries. We have Europe's highest fish consumption per capita, and are among the top four in the world. The primary game species include perch, tuna, conger, grouper, pollock, european bass, mackerel, bream, trout, barbel, carp, among others. 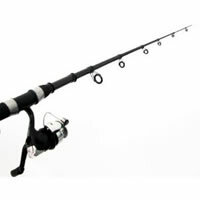 Either for sport or just some outdoor family fun, you can be a fisherman too - just rent a fishing rod from RENT-A-STUFF.